This Diamond Blade is efficiently designed to optimize your ability to cut in tight spaces. The engineered shape of this blade will cut-out that grout situated around obstacles. Aggressive grind away grout without damaging your tiles. Long-lasting diamond blades will get you through larger projects. Also use this cutter for minor notching of ceramic tiles and to cut fiberglass, epoxy, cement, fiberboard, drywall, plaster, stucco, brick or masonry etc. 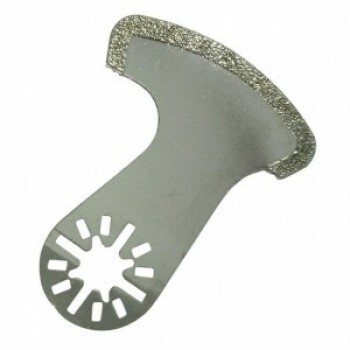 Choose this thin grit diamond blade for tight tile gaps from .075" and up. Diamond cutters are designed specifically for harder grouts. The M031 Diamond-Coated Swing Cutter is your premium choice when working in tight spaces. Use this blade for cutting tile grout, concrete, thin-set or minor notching of tiles.